Why is it that on a rainy, cold day my mind latches on to Cream of Tomato soup and grilled cheese sandwiches and can't let go? Is it just me? I'm curious…if your mind does the same thing, please pipe in below and let me know. And, because like most of us, I overindulged over the Christmas holidays, I wanted to make a lighter version of this classic soup. I was also looking for a very classic, simple version of Creamy Tomato Soup. Don't get me wrong, I love all the oven-roasted, basil, spicy tomato soups out there; but on this particular chilly day, I craved a traditional and simple soup. So, how do you get the ‘creamy' part of the Creamy Tomato Soup without the cream (because of the whole wanting to eat ‘lighter' thing)? Do you remember this Creamy Turkey Soup recipe and it's magic ingredient? If not, I'll spill the beans (pun intended)…pureed white beans! This simple ingredient is opening up a world of creamy, yet fat-free options for me. White or navy beans, well-pureed in your blender or food processor, add the creamy depth and texture that I look for in my creamy soups. And, it has the added benefit of adding extra fiber, protein, and nutrition. Even the non-bean lovers in my family enjoy this soup and did not mind the addition of the beans. And what's a bowl of creamy tomato soup without the requisite grilled cheese sandwich? While I don't have medical condition that prevents me from consuming gluten, I just feel so much better and lighter when I stay away from it. These little cheese crisps, made from nothing more than grated cheddar cheese provided enough of the grilled cheese taste I needed to partner with the soup, without the gluten. I used the Costco brand (Kirkland's) Organic Tomato Sauce and my homemade chicken stock for this soup. By the by, did you know that all Kirkland brand canned products are in BPA-free cans? One of the many reasons I love Costco. If you use olive oil, saute the onions in the oil until soft. Once onions soft, add tomatoes, broth, oregano, salt and pepper and cook on medium low for 30 minutes. While tomatoes cook, puree the white beans with their liquid in your food processor or blender. Add water as necessary to achieve a thick pudding consistency. Add the pureed beans to your tomato mixture. I use a hand blender/emulsion stick to make sure the soup is well blended. But you could just as easily add it to your blender to further combine it. Place 12 little mounds (tablespoon full) of cheddar cheese on parchment lined baking sheet. You can clean up the edges to make them more uniform if you desire. Watch them carefully and take them out when they stop bubbling. They can go from done to burnt in a NY second. We like this soup so much I've made it twice since Christmas. My next task is to make a large batch and can it. This soup almost makes me wish for another cold and dreary day so I have a great excuse to whip up another batch. Do you have a go-to recipe on a cold/rainy day? It is a cold dreary day here in Minnesota! This soup sounds perfect and just what I need! Perfect! Are you counting the says until you can leave that cold weather? Lynn, I can’t even begin to tell you how good this sounds today! I love tomato soup anytime, but our heat went out last night and it’s snowing today and one of the coldest days we’ve had this winter. I would do anything for this soup right now. I love the idea of using beans for a healthier version! It looks delicious! Holy Cow…I hope your heat is back on! Yikes! 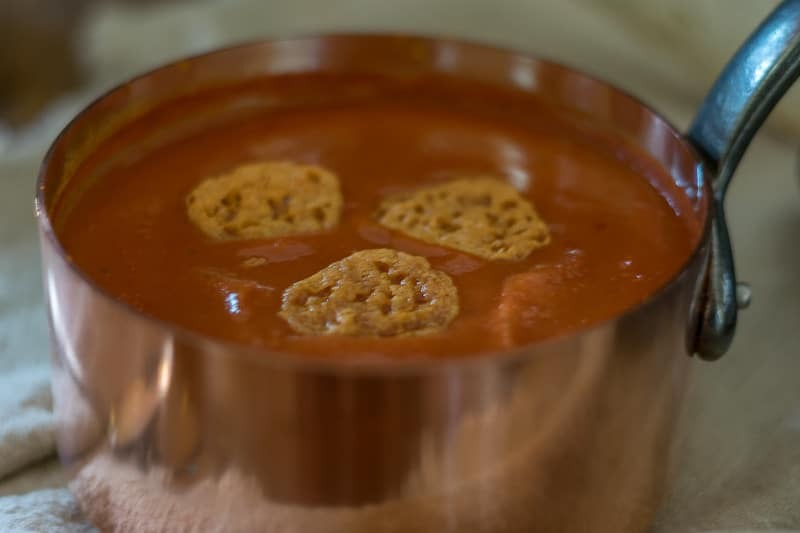 I do hope you like it…I know that you are a tomato soup connoisseur, so would love your feedback. Lynn, this soup sounds wonderful for a January night. I am very interested in trying one of these soups made with beans. 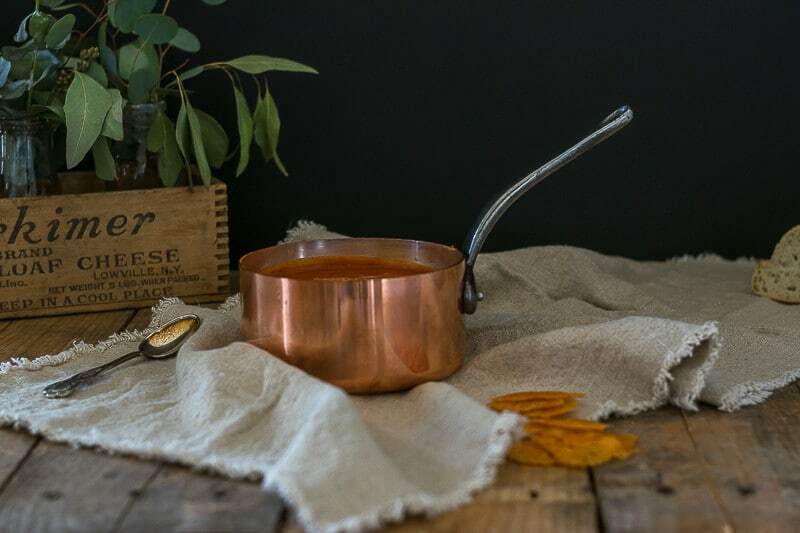 I know lots of people will be excited to find a dairy free tomato soup. Hi Sherry, it is quickly becoming one of my favorite soups! If you have the beans then it’s really easy to make. Enjoy! Lynn, I pinned this right away, this is going to be our weekend meal! I haven’t cooked anything fun in ages just always the same easy and quick meals and I really wanted something different…well, everyone else here too! This will be perfect, it looks beyond amazing!!! I hope you enjoy it Katrin! It is quickly becoming one of my family’s favorite soups. I imagine you get a few cold and rainy days every now and again! I made it Sunday night Lynn, and it was so so delicious! Everyone loved it, even my picky girls. I did leave the onions out, as I knew they wouldn’t want them and I’m not an onion fan, but it was such a great dinner and quite easy to prepare! Thanks for the recipe!! Oh, I am so glad Katrin! It’s become my go-to soup this winter! Thanks for stopping back in and sharing how much you all loved it. And wasn’t it easy!? This does look delicious Lynn! I love tomato soup, and I even have a good recipe, but it calls for cream. I would like to give this one a try but I don’t care for any other Bean except pinto. I was wondering can you taste the white Bean? If not this would be perfect. Hey Linda! Hope you are well. You really can’t taste the beans…they just thicken it and may give it a bit of texture. Give it a try and let me know what you think. Thanks Lynn! I will have to give it a try. Hey Linda…let me know how you enjoy it! I mad the soup and cheese crisps last night and they were DELICIOUS!! My husband’s belly doesn’t always do well with cream and he loves creamy soups (see the problem). The beans were a fast, easy and healthy way to get that creamy feel and flavor. Super fast and yummy soup. We will definitely be having this again. Thanks for another great recipe!! Oh Heather! I am so glad you all enjoyed it…especially hubby’s tummy! And thanks so much for popping back in and letting me know. I so appreciate knowing that others like it as much as we do and had the same dinntertime success with it! Absolutely Loretta…in fact I am planning on making a pot of this soup today. We had company in town over the weekend and I really need to lighten up after we just ate all weekend. The beans really make it seem filling without the fat.